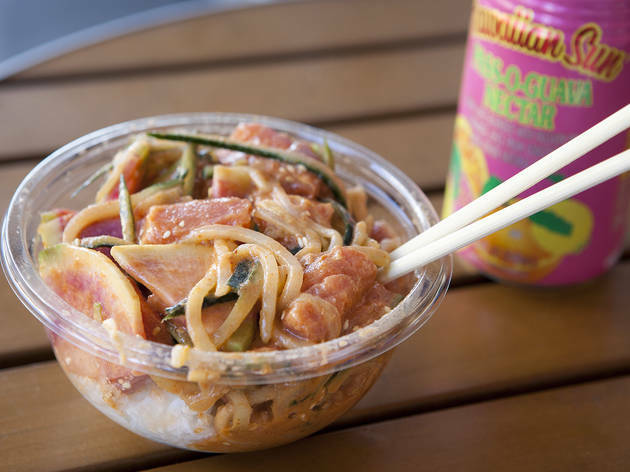 If you’re craving a satiating bite after catching some waves, Big Daddy’s Poke Shop is your spot. Just steps off the boardwalk, this savory and affordable haven serves as a little slice of paradise, offering endless poke options, lush acai bowls, summertime fruit smoothies and—equally important—shaded outdoor seating. And since they’ve deemed themselves the big daddy, it’s only fitting for them to holster one of the largest fixings menu around. Liven up your build-a-bowl with ahi tuna or salmon, wasabi shoyu, house shoyu or siracha aioli, and the likes of pea sprouts, baby bok choy, red cabbage, charred pineapples, kimchi and more. 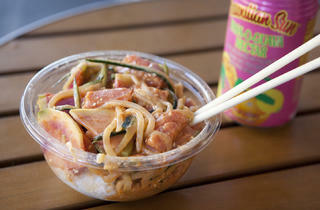 Hungry beachgoers can reel in a lil daddy bowl (one topping) for $9 or a big daddy (two toppings) for $12. Those in the market for non-fish options can dive into the chicken teriyaki bowl or the veggie kale salad, but when you’re at a place like Big Daddy’s Poke Shop, why order anything but poke? The ultimate Poke place in LA! This place has HUGE servings for the same price you'll get for a small at competitors. The crispy onions are amazing here and they have so many different sauces to try. I go here more often than I would like to admit. Located in the corner of Windward and Pacific – close to a bunch of other eateries (Eggslut, James Beach, etc), Big Daddy’s is a great late night Poke spot if you’re already in the area. Service is usually really friendly and they also have acai bowls (great combo with poke). I wouldn’t necessarily make a special trip here just for Poke, but again, after a day at the beach if you’re already cruising Venice, definitely worth checking out. The BEST (and only) Poke I have ever had! Incredibly friendly staff who served great food with a smile, Stayed in Venice for 3 days and visited Big Daddy's everyday and was never let down.